On February 5th, 2013, I posted a blog entry on “Buddhist Sorcery and Astrology in East Asia”. The content of this article basically constituted the preliminary research behind a larger project I had in mind to study the history, development and impact of astrology in East Asian Buddhism. Four and a half years later, I've written hundreds of pages on this topic. At the same time, I've surveyed Daoist and secular sources. My research led me to realize that astral magic – a practice consisting of apotropaic rituals against the planets conceived of a sentient deities – always accompanied the spread of astrology throughout the pre-modern world (arguably, this is true also in modern times, but that is another matter to discuss in the future). So, my topic became astrology and astral magic in East Asia, with a primary interest in what these meant for Buddhist traditions in China and Japan. One of the biggest highlights of my research to date has been the realization that China received a quite significant amount of materials related to astrology and astral magic from Iranian sources starting around the ninth century. My argument, which I've explained in the publications listed below, is that China shifted from Indian sources of astrology and astronomy to Iranian sources around the turn of the ninth century. Kotyk, Jeffrey. “Astrological Iconography of Planetary Deities in Tang China: Near Eastern and Indian Icons in Chinese Buddhism.” Journal of Chinese Buddhist Studies 30 (2017): 33–88. ------------. “Iranian Elements in Late-Tang Buddhist Astrology.” Asia Major 30, no. 1 (2017): 25–58. 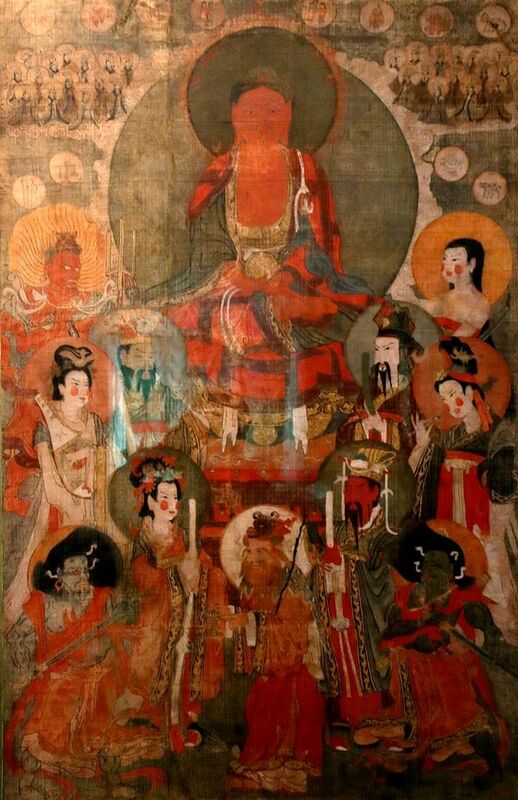 The incorporation of the Iranian icons of the planetary deities into Buddhist and even some Daoist literature immediately indicates that religious professionals during the late Tang dynasty (ninth century) easily adapted such materials for their own purposes. The type of horoscopy that was introduced into China at this time was also largely, if not entirely, Iranian in origin (of course, it ought to be noted that said Iranian sources borrowed Indian elements). The extent of Iranian influences on religion, astrology and astronomy in the late Tang has, in the past, been noted by other scholars, but my research is perhaps the first step into deeply excavating Near Eastern materials in religious traditions of the late Tang. My approach to the materials at hand has been mostly philological, in that I examine the Chinese and Japanese texts, as well as the relevant iconography, in close detail, with careful consideration of the dating of everything. One of the first things I did when I started my PhD research was to construct a critical chronology. It became evident just looking at various sources that traditional attributions of authorship – which, unfortunately, are often accepted uncritically by modern scholars – are often spurious. However, many of these texts can be dated based on internal evidence alone, primarily by examining the texts they cite. We can also check when the texts were first recorded in Japanese sources. This whole process is made easier by the fact that most of the East Asian Buddhist and Daoist canons are digitized. Turning to the matter of astrology itself, I would say that it has been a rather complex task, since one has to differentiate between Indian nakṣatra astrology, and the art of classical horoscopy. The latter has its roots in Greco-Egyptian Alexandria (starting in the 2nd century BCE). In addition, China received astrological texts from Indian and Iranian (Persian and Sogdian) sources. The latter included a translation of the manual of Dorotheus of Sidon (probably not the original Greek, but in Middle Persian), and other works that combined Hellenistic astrology with Iranian innovations. Learning horoscopy is a lot more complex than learning the system of basic Indian nakṣatra astrology, since the latter is chiefly concerned with the significations of the Moon in twenty-seven or twenty-eight lunar stations. Horoscopy, conversely, requires that you first produce a table (the horoscope) indicating the positions of the planets at the hour of interest, which itself requires knowledge of observational astronomy, or at least tables indicating those positions (called ephemerides). 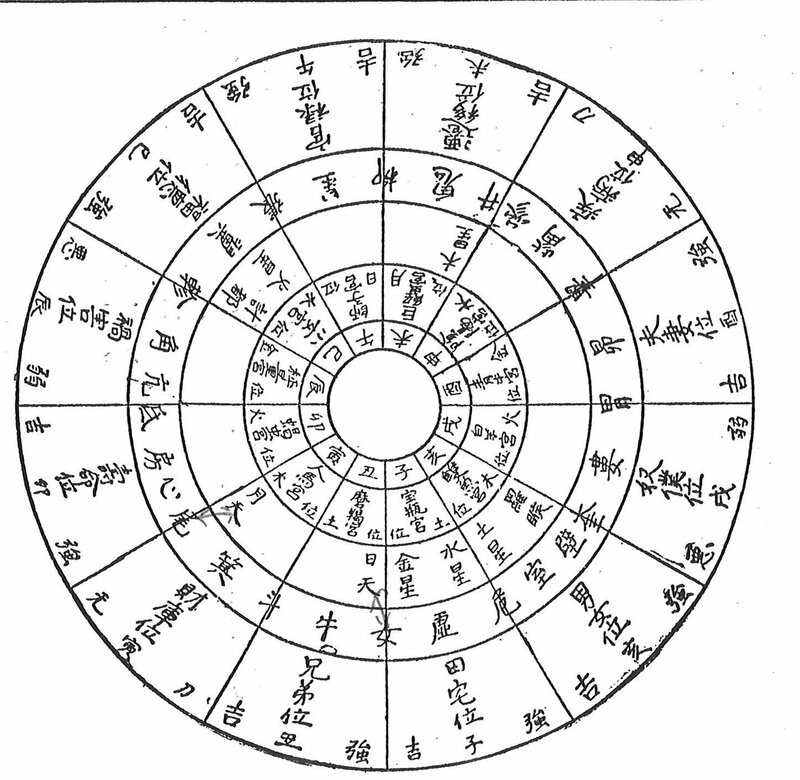 In East Asia, astrologers produced horoscopes using Chinese observational astronomy, which is completely different from the occidental systems that have their roots in Mesopotamia. Once you have the chart – say, for instance, indicating the planetary positions at birth – then you interpret the specific significations of each planet and its position, as well as the relationships between the planets, using standard lore and doctrines. It takes a fair amount of basic study, paying close attention to original classical sources (that means excluding Renaissance and modern systems of astrology), in order to really grasp how horoscopy works. I learned how to cast a horoscope and interpret it using the original Hellenistic doctrines. Chris Brennan, a modern scholar of Hellenistic astrology, has an online course, which I took, that teaches one the essentials of classical horoscopy based on original Hellenistic sources (see here). I recommend his course and his book. One conclusion to which I've arrived recently is that astrology ought to be treated as a whole other religion in itself, with its own history and doctrines, as well as its eminent figures, both legendary and historical. The original eminent figures are actually irrelevant in East Asia, but the art of horoscopy itself includes a coherent body of lore and systematic techniques based on the premise that many things and events in the world are predetermined and directed by fate, however that is metaphysically conceived. Exactly how that is supposed to work with the Buddhist idea of karma – the idea that suffering and ease are products of individual action – is itself an interesting topic, and actually this highlights my point that horoscopy is basically a separate religion or “sub-religion” that can be appended to a “host religion”, even when the basic premises between the two are nominally incompatible (bearing in mind that Buddhists can and often do hold views that are incompatible with scholastic interpretations of karma). How did Buddhists in China and Japan conceive of astrological fate? In short, it seems that the basic idea was that you were born under certain astrological circumstances, for better or worse, based on your past life karma. So, if you had negative karma, you would be reborn under bad stars, and would just have to live with that for the rest of your present life, just as if you had been reborn without eyes as a result of negative past life karma. There is also the idea of “transits” in astrology, which refers to the movement of planets through key zodiac signs relevant to the individual in question. A malefic planet like Saturn, for instance, spending three years transiting through your “first place” (the zodiac sign rising at the horizon at your birth) would be thought of as potentially alarming, but not necessarily fatalistic, since magic could be employed to placate or please Saturn. The fact that magic could be used to this effect points to the belief that the planets were conceived of as sentient deities, to whom petitions and offerings could be made. In that sense, there is less of a problem with karma, since in Buddhism there is nothing unusual about interacting with deities, including even mundane ones who preside over the natural world, such as Agni for instance. We might divide astral magic of the late Tang into two types: Indian and Iranian. The former is often employed via a maṇḍala. There are various mantras and dhāraṇīs for the navagraha. Iranian astral magic, on the other hand, employs ritual magic that includes prescribed offerings (incense, types of foods, and objects of specific colors), dietary restrictions (for example, refraining from beef due to the association of the bull with Saturn) and production of icons, either on paper or as sculptures. As part of my research into astrology, I inevitably read about astral magic elsewhere in the world, which is perhaps most well-known in the Western world via the Latin Picatrix, an often dark manual of magic that was translated into Spanish and Latin during the thirteenth century from an Arabic text. I discovered that the icons and magic related to the planets in the Picatrix share many parallels with those found in Buddhist and Daoist texts. The most striking of these is the icon of Saturn. 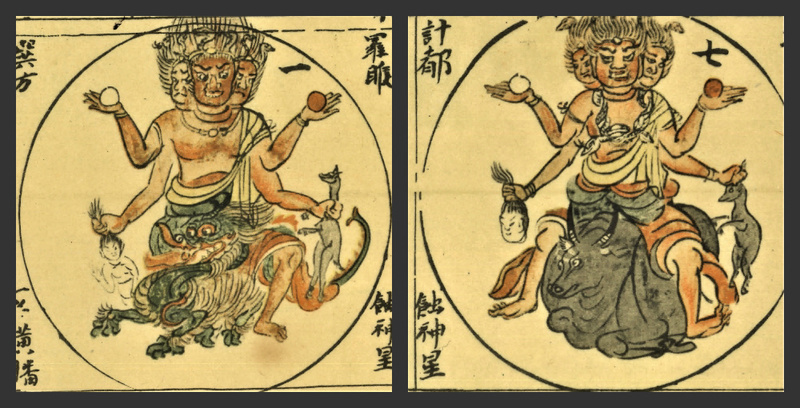 The icon of Saturn in the Genzu mandara 現圖曼荼羅, the Japanese version of the *Garbhadhātu-maṇḍala 胎藏界曼荼羅, as well as in various paintings of *Tejaprabhā 熾盛光佛, is actually the Greco-Egyptian Kronos. In the center is Saturn as he appears in the Japanese Garbhadhātu-maṇḍala. 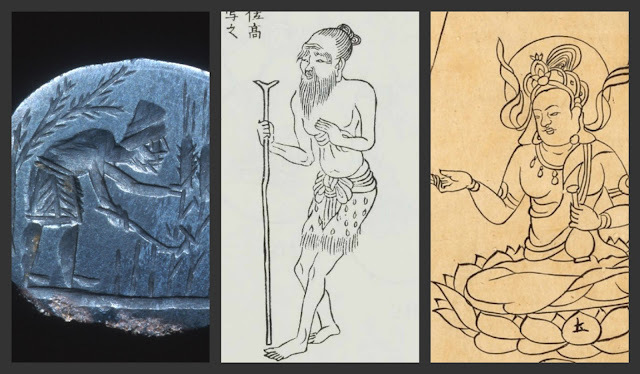 The left image is an engraving on a stone of Greco-Egyptian Kronos.1 The right is Śanaiścara (Indian Saturn) as he appears in the Taizō zuzō. The ritual and prescribed incense for Saturn all additionally indicate that this deity is Kronos, known as Kēwān in Iranian (Middle Persian and Sogdian) sources. His ritual is also found in a Daoist text from the late Tang or shortly thereafter, which tends to indicate that his cult in China was probably fairly popular for a time, the reason for this being that he is not only the foremost malefic planet, but also because he governs longevity. Daoists, naturally, would have been attracted to such a deity. Buddhists, too, frequently borrowed from Daoists sources at this time. Chinese authors predictably combined Indian and Iranian sources, which can easily lead to misunderstandings by modern scholars about sources, since Iranian sources also earlier drew upon Indian materials. As example, the evolution of the icons of Rāhu and Ketu in China need to be understood chronologically: the early icons are Indian, and the later icons are Iranian. The earliest illustrations of Rāhu and Ketu in China are found in a Japanese manuscript, the Taizō zuzō 胎藏圖象, which is traced back to the icons introduced by Śubhakarasiṃha 善無畏 (637–735) during the 720s. Rāhu here is a decapitated head with hands with which to grasp the Sun and Moon. Ketu, which at this point in time was associated with comets (not yet the descending node of the Moon), appears as if shooting out from a cloud of smoke. One rather interesting discovery I made about these icons is that almost identical icons are described in a text from sixth- or seventh-century Śaivism, titled Śivadharmaśāstra. I discovered this as a result of discussing said text with Prof. Bisschop at Leiden University, who is translating the Śivadharmaśāstra. We were discussing the evolution of the navagraha, and when I looked at his translation of the verses describing these two deities, I immediately remembered the icons of the Taizō zuzō. This finding really highlights the benefits of wider discussions between Sinologists and Indologists. With respect to the Iranian representations of Rāhu and Ketu in China, one distinguishing feature is the appearance of serpents. This stems from the conception of the ascending and descending nodes of the Moon as the head and tail respectively of a dragon. However, what is even more characteristic is Ketu (or sometimes Rāhu) represented as a demonic-looking man seated atop a bull. Why a bull? This is gōzihr “bearing the seed, having the origin of cattle” or “the ox” (see Encyclopædia Iranica). We see this Iranian motif in the Bonten kara zu 梵天火羅圖, a medieval Japanese document displaying the planetary icons, and based on Chinese sources from the ninth century. One other icon of interest is that of Yuebei 月孛. All the evidence points to this being Semitic Lilith or Iranian Āl. The latter derives from the former (see Encyclopædia Iranica). Yuebei is treated as a planet in Chinese horoscopy of the non-Buddhist type, but like Rāhu and Ketu, it is not a physical body, but rather an astronomically tracked point of interest. In the case of Yuebei, it is the lunar apogee, which interestingly in modern astrology is also called Lilith. I have searched for the origin in modern astrology between Lilith and the lunar apogee, but to no avail. I would assume that the modern Lilith was adapted perhaps from a Hebrew source, but I am only speculating about that. This requires further investigation. In the top right we see long-haired female figure with bare shoulders, who stands in contrast to Mercury the scribe, who is fully clothed. 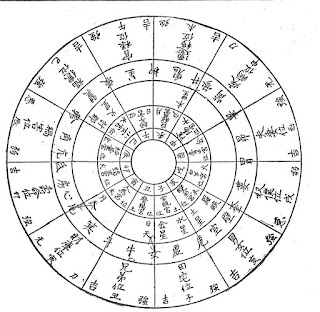 There is a lot of astrological lore associated with Yuebei in Ming dynasty manuals of horoscopy, which is something I need to investigate further. If the icon of Yuebei is in fact Lilith, then it stands to suggest that the astrological lore associated with this planet is also of a foreign origin, rather than having been invented by Chinese authors. 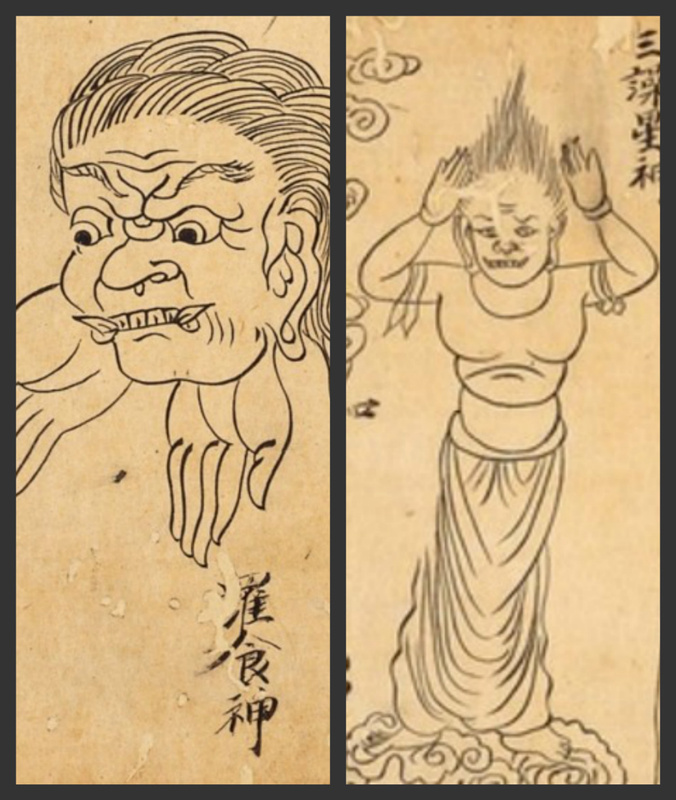 I briefly touched on this in my paper on iconography, but it is worth repeating that Yuebei is associated with lust in medieval Chinese horoscopy, which very clearly has a parallel with the religious lore surrounding the demoness Lilith. I hope to write on the astrological lore of Yuebei in a future publication. Recently, I've been researching the Japanese tradition of Buddhist astrology, the Sukuyōdō 宿曜道, which existed from the tenth to at least the late fourteenth century. We fortunately have two known extant horoscopes from this tradition, which I've been studying. The one for an individual born in 1113 (its chart pictured above) is very intimate, in the sense that it was written for someone concerned with worldly fortunes and their lifespan, not spiritual attainments or scholastic achievements. When I read it, I couldn't help but feel it is more or less the same type of reading you would get from a modern practitioner of classical horoscopy. I've written an article on medieval Japanese Buddhist astrology and astral magic that I hope to get into print next year. The next big step in my research is to look at the sixteenth century Xingxue dacheng 星學大成 (Great Compendium of Star Studies) by Wan Minying 萬民英 (1521–1603), which is an enormous compendium (close to 600 pages) of information related to horoscopy as it was understood in sixteenth century China. One of the interesting things is that at this point in Chinese astrology, elements from traditional Chinese lore had entered into their practice of horoscopy, and a lot of the earlier doctrines had been modified or even misunderstood by some. In the case of Wan Minying's work, I am of the impression that a lot of the earlier horoscopic lore from the late Tang is well-preserved, but he seldom cites his sources, so this has to be inferred. To sum up, I've spent the last four and a half years studying the introduction of astrology into East Asian Buddhism, and this led me to look at a lot of areas outside Buddhism specifically. I've greatly enjoyed doing this research, and I feel there is a lot more to read and ponder, such as documents dating back to the tenth century unearthed at Dunhuang in China, as well as texts not presently found in any major corpus. Actually, I suspect that in Japanese monasteries one could indeed find relevant manuscripts, but finding them and moreover gaining access might prove a challenge. 1 Photo from James Evans, “The Astrologer's Apparatus: A Picture of Professional Practice in Greco-Roman Egypt,” Journal for the History of Astronomy 35, no 1 (2004): 17.